The Scan Man has some up close and personal experience with the Kodak i920/i940. The scanner is far faster than you would expect from its small size. The footprint is tiny and this is truly small enough to carry to appointments or on a business trip. I find the image quality to be excellent. Utilizing Kodak Smart Touch to pre-configure up to 9 pre-sets, you can scan just about anything. 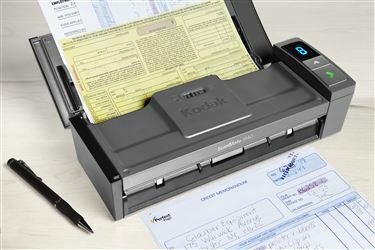 For the small business person, it is very good for handling business card scanning. The scanner has a small tray that will hold up to 20 cards. As of this moment (software included with scanners changes all the time), Presto Biz Card reader software is included for free and it works efficiently with the scanner. Presto Biz Card Reader normally retails for $69.95. On a scale of 1-10, 10 being best, this scanner rates a 9. This is a Modern Image recommended Best Buy.